Ok, who's coming to visit me so I can take them to the new "Ledge" at Sears Tower....er I mean Willis Tower? Oh, who am I kidding, I'm a tourist in my own city. I couldn't tell you how many times I've been stopped in this city with questions of "oh where are you from?" or "Do you like Chicago?" I guess it's because I always have my camera ready and I enjoy doing all the touristy things in Chicago. Who says that toursity things are only for tourists? Shouldn't one enjoy the city they live in, regardless of where it is? People from around the world come to Chicago on vacation - just like we did for Amsterdam. So I always act like a tourist when I'm out and about enjoying this fabulous city. But I have digressed, haven't I? 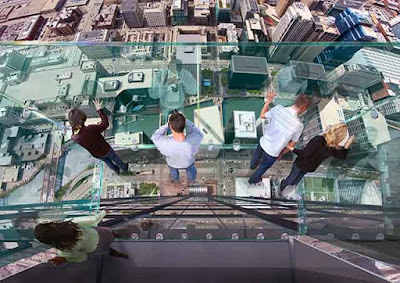 In an attempt to rebrand itself from "Sears Tower" to "Willis Tower" and to also give them another reason to put themselves in the news....they are adding a new glass skydeck to the already existing observation deck at the Sears Tower. It reminds me recently added observation deck they added to the Grand Canyon that lets you walk out and over it.....I for one can't wait for this deck to arrive so I can go check it out....even if it does cost $15 bucks to go up there...it is an amazing site to behold! @Andrea - next time you are here, we're going! @Freddyeyes - come on, I'm sure she would love it!